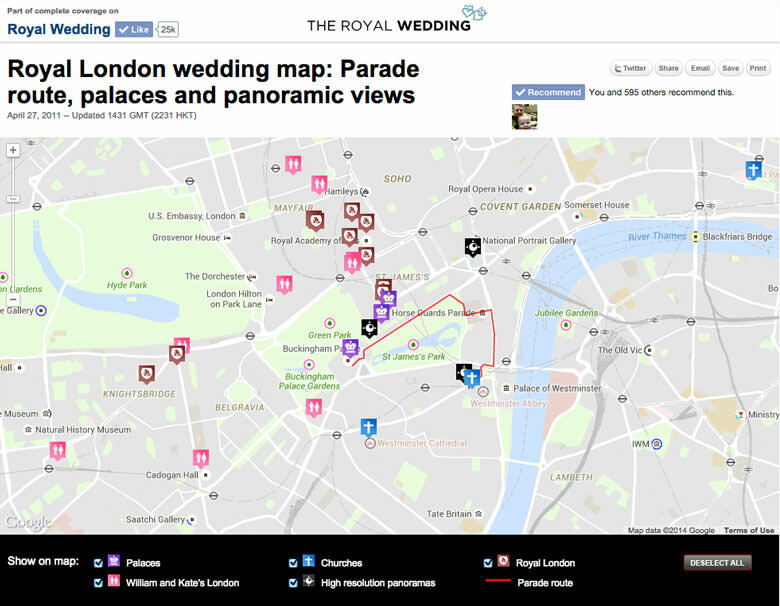 Using the google maps API, i plotted parade routes and locations related to the royal wedding with custom icons and pop-up boxes. The most interesting aspect of this project was the use of custom panoramas, I decided to use (at the time) the new API for Google Streetview - I scouted out the best locations to watch the parade before the day and shot super high-resolution, 360 degree panoramas and then placed them into the map using a tile cutter plugin I wrote for photoshop and a bash script to organise the 13 levels of zoom in each panorama. I also managed to fool the location api, allowing in-panorama overlays of key points and imagery.